Eddie White’s career as an artist began in the Staunton, Virginia’s Historic District where he painted and worked in silkscreen printing. Edwin White Studios, an art gallery and print shop was one of several retail businesses located in an old flour mill, restored and aptly named “The Factory”. Eddie participated in art and craft shows throughout the southeast with his watercolors, pen and inks, glass etchings and silkscreen prints. A move to Chapel Hill, NC in 1975 brought a change of interests. As an experienced carpenter and draftsman, Eddie designed and built homes and additions in the Research Triangle area. He also worked as a freelance graphic designer developing image campaigns for businesses in Chapel Hill and Carrboro, NC. A move back to the Shenandoah Valley and a walking tour through Scotland inspired Eddie to return to abstract art. He produced not only painted landscapes but also constructions of local hardwoods, glass, metals and mirror. He became a member of Carolina Designer Craftsmen working in these media. 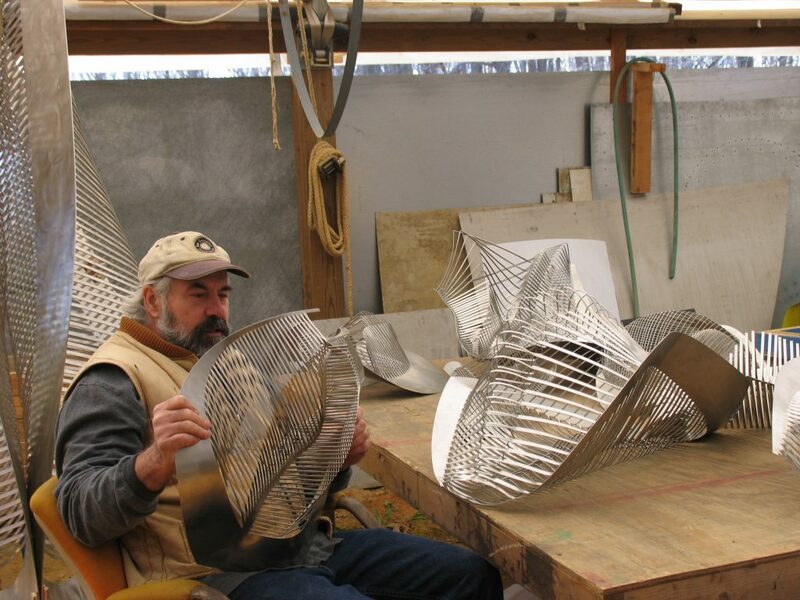 After several years of designing and building homes, including his own, Eddie helped design and later prototyped a surgical staple remover for a medical instrument company in Research Triangle Park, N.C. This project initiated six years of product design, patent development, and prototyping for numerous companies seeking new product or product upgrades in the medical device industry. Since the year 2000 Eddie has pursued sculpture. He was a member of the Chatham Artists Guild for several years, but has more recently focused on corporate and private commissions. His first major commission came in 2003 when he created “Mengembang” (in the Gallery-Commissions) for the Hilton Hotel in Kuala Lumpur, Malaysia. 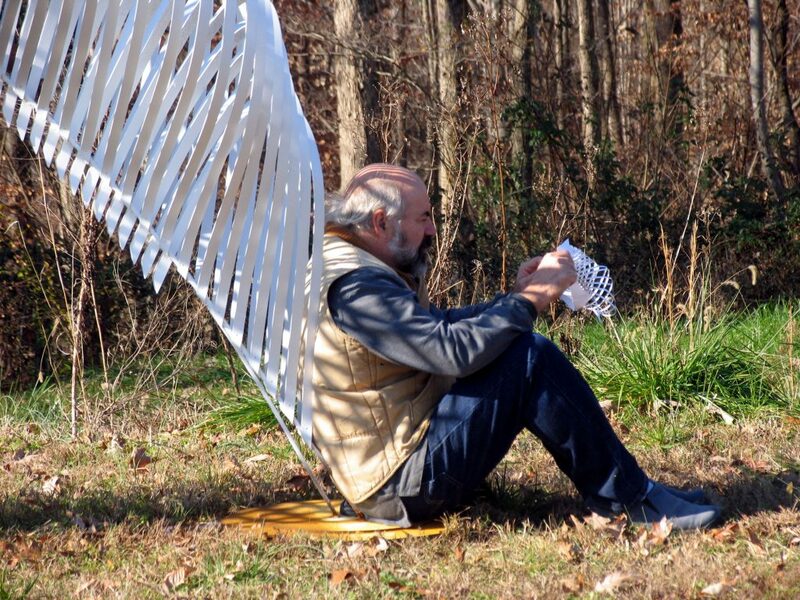 His studio is now at home on the Rocky River in Silk Hope, NC where Eddie lives with his wife, Gwen. Their daughter Jesse lives in Washington, DC where she teaches Art at Roosevelt High School. My most interesting and engaging sculptures are developed through problem solving. For me, the art making process focuses on revision and change. 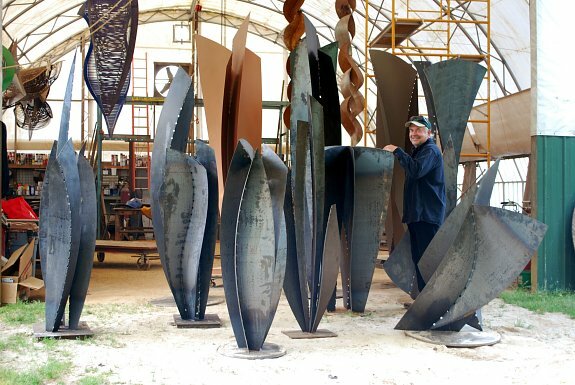 Therefore, my sculpture speaks to the exploration of shape and form and the discoveries that lie within that exploration. I find that I work best when I have an end-point for a piece in mind; a site specific idea that I can direct my work toward. Approaching art-making in this way allows for challenge and process to inspire and guide the finished product. An ongoing interest in the technical aspects of art and design heavily influence my work. Some of my pieces are organic in shape but many are geometric. I am most often drawn to opposing shapes and double images; the juxtaposition of line and form. My most recent metal work uses many of the same lines and shapes as my earlier work but with more authority and durability. 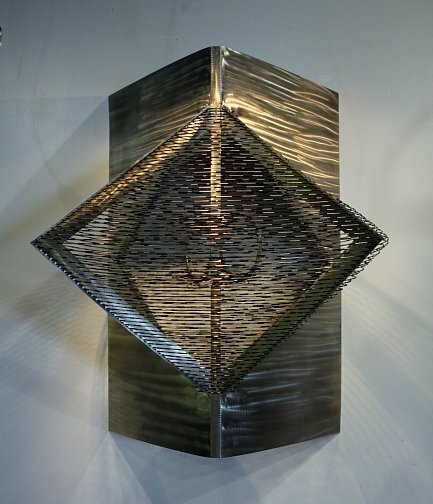 You will find that I have worked to emphasize the structure and physical presence of my pieces by accentuating the connections of line and shape. I strive to illuminate the visual significance and beauty that can be found within the technical design of a piece. Some of my latest pieces include materials other than metal. I have begun working with a combination of wire, string, and plastic tubing to create more intricate sculptures. Some have metal frames and others are open frame, with only a metal base for support.These pieces rely heavily on pattern to create focus and meaning. I continue to investigate shape and form but often through more literal subjects—bodies, figures, and recognizable images. I segment and section these forms to explore shape relationships, create movement, and build visual interest. Through this technical manipulation, I often discover and attempt to relay more in-depth, subjective interpretations of the interactions within the chosen imagery.